Today wine technology has advanced more than ever. 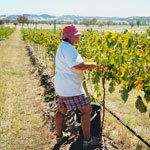 Making good wine not only involves good winemaking and a lot of hard work. Attention to viticultural detail also goes a long way to increase the quality of raw material (grape) and achieve that extra something in the final product. Wines are not just wines, as every wine has a story. As a producer we can give you the best source of information on how the character of a particular wine was achieved. Dumaresq Valley Vineyard aims for high quality wines and achieving this level requires good viticulture management such as pruning, reducing yields, monitoring irrigation, and trellising methods just to name a few. In return we can obtain optimum fruit flavour and ripeness. Soil selection in a vineyard dictates wine characters. Dumaresq Valley Vineyard lies on clay soils, these soils give rise to deep vibrant colours in our red wine selection. It doesn't stop there though; Grapes are carefully hand picked during the cooler hours of the morning and stored in cool rooms up until transport to the winery. It's important to keep grapes cool, as this allows fruit to keep its structure and composition intact (with no loss of flavour and no spoilage from unwanted micro-organisms) right up to the wine crushing process. From there its all up to the wine maker to play his role. With quality fruit, the wine maker in return will produce a high standard wine.